Our low cost brands, specialized in providing extremely affordable car rental service have increased by one – CARSSOFIA. The company will service Sofia and the region, as well as the winter resorts Bansko and Borovets. The prices start from 6 euro/day for the long rentals (only 7 euro/day for weekly rental) manual gearbox cars and from 7 euro/day for the automatic g.b. cars. 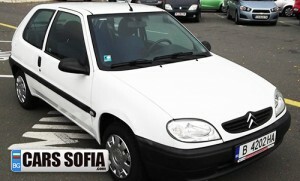 Citroen Saxo, 3-door with manual transmission will cost only 49 euro for 7 days rental! CARSSOFIA office is located between Terminal 1 and Terminal 2 of Sofia Airport (Mimi Balkan Street 140, Office TOP RENT A CAR). We have provided a free shuttle from the terminals. You can book online at the official site http://carssofia.com and pay online by credit card or on arrival when you take your car. Prev:New Terminal 2 at Burgas Airport: officially opened!